The first time I meet Bahaulddin Rawi, he looks like nothing I expected. He wears a navy blue suit with a fur-collared jacket and smiles with his whole face when I shake his hand. We sit down at a quiet café and he orders a piece of cake and a cup of tea. I compliment him on his suit and he proudly tells me he designed it himself, and that it wouldn’t have fitted him if it weren’t for his month-long travel to Finland. “I lost 20 kg in 23 days” he explains. Five months ago Rawi was in Iraq. He was a daring journalist and a beloved teacher who liked to address public issues trough his writing. He also tells me he got dismissed from one of the local TV programmes he was hosting because of his outrageous statements. It wasn’t until his town, Ramadi, was occupied by the Islamic State in 2013, that Rawi had to put his career as a journalist aside and find somewhere safe to live for him and his family. Rawi and his family were forced to move to Baghdad, but they found it to be the wrong place for them. As they were Sunni Muslims, and most of Baghdadi citizens were Shia, they weren’t accepted. “It didn’t work, so when I got a work placement in Kurdistan, I left. I placed my family in a small providence next to Kurdistan and sent them money on a regular basis”. 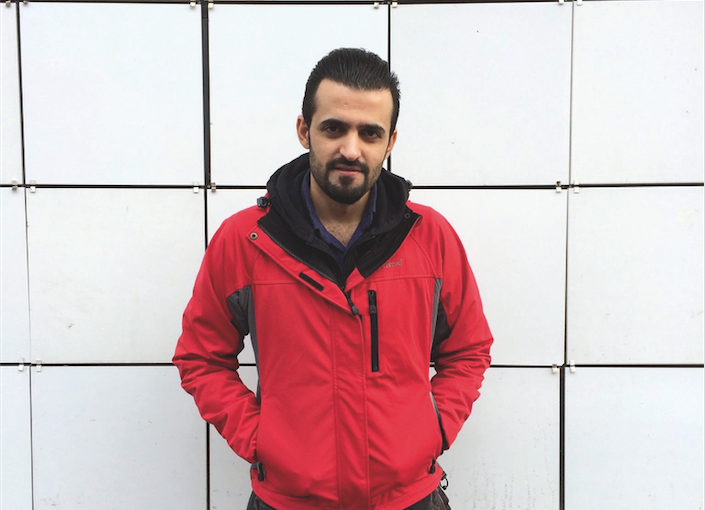 Rawi faced another distressing period of his life living in Kurdistan as an Arab. “They knew I didn’t belong. My language and face gave me off,” he remembers. Rawi started saving money and looking for someone to smuggle him all the way to Finland, where he was determined to go. He found a smuggler, paid him 5,000 Euros and began his first and last legal part of the journey, a plane from Iraq to Turkey. 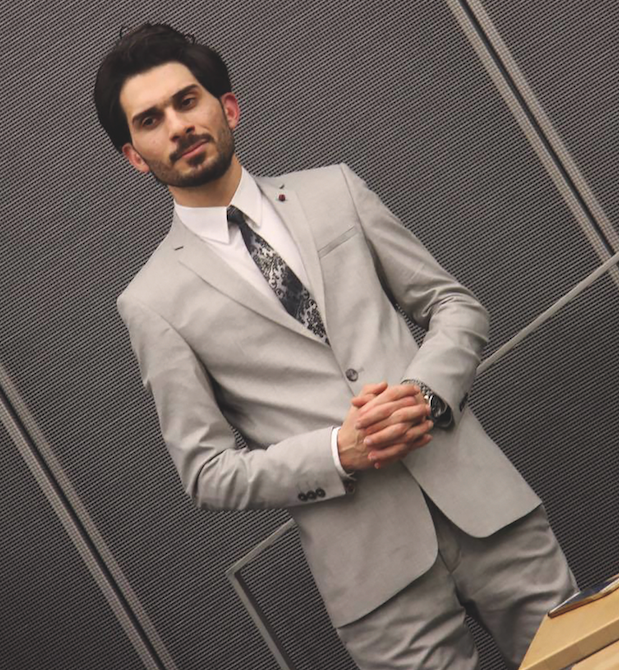 Bahaulddin Rawi in Finland wearing a suit he designed himself. “The rest of my travels were all illegal” he laughs. “From Turkey we took a small boat that was headed for Greece. We were more than 40 people on the boat, including women and children. The three hour journey was horrible. Since we were too many people on the small seven metre boat, we all had to throw away some luggage for it not to sink. Fortunately we made it to the shores of Greece, safe and sound”. Since Rawi was the only one who knew English of his travel companions, he had a lot of work to do during the journey trough Europe. “I was very stressed from helping everyone all the time so sometimes I forgot to eat”. Although somedays they didn’t even have food, or then they had to save their money for further purchases down the road. Rawi made it from Greece to Macedonia, from Macedonia to the border of Serbia, where he was totally ignored by the Serbian police. In Hungary, Rawi experienced the most devastating moments of his journey. With no food, he had to hide in the Hungarian forests, being chased by police and dogs. “They acted like we were there to rob and kill them” he recalls. Once again Rawi’s journey took a turn, but this time for the better. Vienna was were he first felt like he had reached Europe. “I remember thinking: this is Europe!”. They knew I didn’t belong. My language and face gave me off. Some of Rawi’s friends liked Vienna so much they decided to stay, but Rawi had other plans. “Once I decide to do something, nothing can change my mind” he explains. He got a fake plane ticket, that “looked just like an actual one” and started preparing for Finland. Unfortunately a plane ticket wouldn’t suffice. “My smuggler told me that I had to look more European. I shaved all my facial hair and convinced myself I was Italian and not Iraqi”. When a refugee comes to Finland, he has to go on three different interviews. One with the immigration service and two with the police. Once Rawi stepped foot on Finnish soil he went straight to the police station and finished the first interview like a champ. I asked him if there were any consequences on him traveling illegally to Finland. “Of course not” he says, “they were just happy that I came to them at once”. Life in Finland has started well for Rawi. He no longer lives in a refugee camp, but with 10 other refugees in a small apartment. “It’s crowded and sometimes we have arguments related to our different beliefs and religions. I’m not too happy here, but I’m comfortable. I know that I have it better than my family”. With tears in his eyes, he tells me he hasn’t heard from them since December, and that he doesn’t know whether they are alive or not. In Finland, women are powerful, where as in Iraq, the women don’t have rights and they are not as appreciated as men. Despite everything, Rawi keeps himself busy by participating in different projects that help refugees get back on their feet and start a new life. He has also held a couple of seminars at the local university, talking about the refugee crisis and what it’s like to be one, among feminist seminars and a food event for refugees. “Through these projects I’ve met many influential people, like journalists, doctors and teachers.” Rawi says, explaining why he has been able to write a few articles for the Finnish local newspapers already. He is thankful that he has been able to continue working as a journalist, even though he is a refugee. He has a lot of different plans for the future. “I hope to educate the Finnish people on the social issues of Iraq. I want to write about gender and sexuality in Iraq and the Middle East, and compare it to the western culture. In Finland, women are powerful, where as in Iraq, the women don’t have rights and they are not as appreciated as men”. After a hazardous journey across the globe, it seems that Rawi is gradually making a life for himself in his new home country.